This one I picked to bring forward again because I’m glad I recorded this post about getting around some of the significant Life imposes on those with disabilities and chronic illnesses: finding ways to keep the raft of experience growing even as we chop off pieces to fund our work. I have to find a way to make the singing a bigger part of the current life. And it is also timely, as Easter is next Sunday. I have been coping all morning with the side effects of yesterday, not being able to write, nor even look at my notes for, the current scene under revision in the WIP. And yet, I am not unhappy. With the limitations of CFS, I live a tiny life: I try not to leave the house more than 2-3 times a week, I say no to almost everything, and I have worked hard to create a schedule that puts the writing first (Get up. Grab First Diet Coke. Block internet for 2 hours. Write. Take First Nap. Get up. Grab Second Coke, protein breakfast shake. Block internet for 2 hours. Write. Take Second Nap. Phew – most of day is now gone.). My house is, understandably, a disaster area. The bills get done when I am either forced to or have a functional period after the writing. Taxes, end of year deductions, holidays, occasional trips – all interrupt the flow, and take a week to recover from – and get back on schedule from. They are necessary, so I pay the price and don’t worry about it too much. If there’s energy, I write – I don’t spend it on housekeeping. It leaves little time for the ‘life experiences’ writers need to grow – a Hobson’s choice. But for ten years I made space for a weekly singing lesson (even though the teacher said I should practice an hour every day – and it was a rare week when I had any energy for doing anything other than singing if I had to drive myself somewhere that week). Up to 8 times a year I go to a Folk Sing on a Friday night. And a year ago, when they were soliciting new members for the tiny choir that sings at the Princeton University chapel for the 4:30 Sunday Mass I attend when classes are in session, and knowing that they practiced before Mass (rather than having a separate choir practice night, which would have been an additional outing every week), I volunteered. With the caveat that it might not be something I could continue doing. For those who sing, I needn’t explain the joy of learning something in four-part harmony every week, however short. For those who don’t, just know that I am treated as if it’s obvious that I CAN, and that’s enough. After a year, which I survived, we were challenged to take turns as Cantor (it’s an erratic crew due to school and other commitments, and we were down to two or three who had cantored – yesterday all but one couldn’t come). One additional training session required – I can do this: I said yes. Yesterday was My First Time – and, minor bobbles aside, it was glorious, and made up for the loss of Saturday (preparation), Sunday (warmup, practice, Mass! ), and today, Monday (can’t seem to get it together, and it’s 4:34pm). Let me say it this way: there is nothing to compare to the experience of opening your mouth and pouring sound into a properly-designed nave and choir in a stone cathedral. It is a living thing that feeds back the sound and amplifies your voice enough to fill the whole. I prayed – went for it. The feeling is a shock, the feedback amazing. The first notes of the a capella Kyrie (which I may have been a third low for – but it doesn’t matter, as the cantor sets the note, and all the rest are relative – the organist had told me not to worry, to just go for it and with it, rather than get a note from him) – me, alone, for a few seconds, and then the rest of us joined in – was an experience that is not available for money. Nor should it be. It is only available for love – and without fear. The same for the first verse of the meditation, followed by all of us singing what we have been singing throughout Lent. 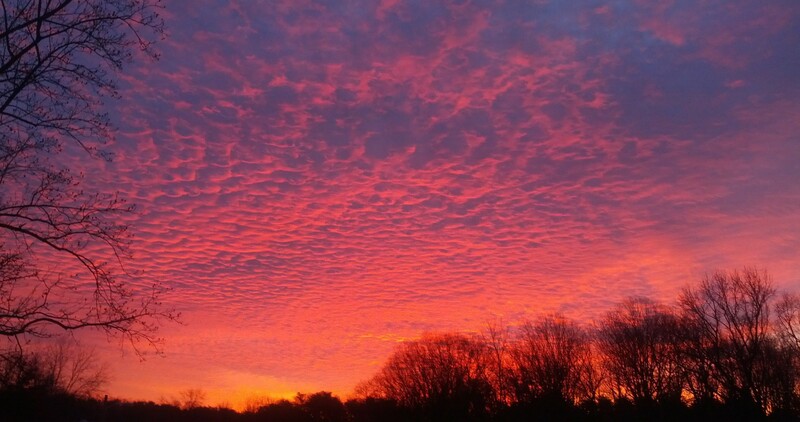 This entry was posted in Brain training, CFS - living and writing with ME/CFS/CFIDS, Repeats, Short posts, This writer's life and tagged Catholicism, gratitude, inspiration, Life on April 14, 2019 by Alicia Butcher Ehrhardt. And meanwhile, visitors are welcome from anywhere! Stop and say hello – comments welcome. I’m going to steal the following from a fellow blogger: I like to have the last word, so you’ll always get an answer. If you don’t, know that I still read your comment – and decided to let you have the last word on the subject (at the end of an exchange, usually). Things are getting a little less crazy around here. We went to visit our kids in Boulder, Colorado, and had a lovely long weekend. Then we came home, and I had an old friend visit for two evenings – she arranged her life to be able to visit, and it was so good to see her again. We go back 50 years+! And then came the visit to the new, nice dentist – except that he had an emergency, and the total time dedicated to an appointment which was literally across the road came to over four hours – and I get wiped out by long out-of-the-house events. I don’t care – all these were desirable (I love dentists who don’t find anything needing doing, even when a bit of a porcelain crown cover came off) – and much appreciated visits with loved ones. I’m getting to the new stuff. One of the residents here, of the several who have read Pride’s Children: PURGATORY, chatted with me this afternoon about her reactions to it – and has offered to connect me to her book club. Book clubs are wonderful ways to get word of mouth out to serious readers, and I look forward to maybe even visiting some of the many in our new city. I get so few opportunities to just talk and answer questions about my writing (one tries not to be a pushy author) that it was a real pleasure, as well as good for the soul. She got so many things about the work. One of my main questions – because it’s a trilogy – is always whether readers were unsatisfied at the end of what is known to be the first volume, and feel cheated in any way. She said no – but she can’t wait for the next one – which is balm to my senses. She also said she had trouble putting it down, and for someone whose nightly habit is to read a bit with her doggie settled in her lap, and then go to bed, I find it cheering to be unputdownable. I ordered and received a proof copy from Amazon. Createspace has closed, and the automatic transfer to being printed on demand by KDP (?) has to be checked out. The cover looks fine (except that it says ‘proof’ on it, right through the middle of Kary’s head), but I need to compare the paging, and look for the few errors that have been corrected, and make sure they are using the latest file. Due diligence. Then I’ll see about ordering some replacement copies to have as my pre-move supply has all been given out at our new community. And the usual small problems. My .mobi electronic ARC has NOT worked for the last two people I sent it to, which means Kindle changed something, and I need to re-create the file to send out for reviewers. There are few things worse than getting someone to read and review for you, and to send them a file they can’t open! I just found my writing books – I used to have them at my right hand while writing, but haven’t since everything was packed and shipped: what have I missed and will it show in the new scenes? I still haven’t recovered from last July’s crash. I can’t remember where I was on so many little details of life. And writing. before I finish the trilogy – if I have anything to say about it. And the good Lord gives me life and brain. Things can only get better – I’m excited at the possibilities, and cheered by finding readers here. I will get my software, computer, and backups under control. I’ll keep writing, and make the progress I had hoped for from the new digs. It was always about the pools. Does your future have pools? This entry was posted in CFS - living and writing with ME/CFS/CFIDS, disability, Promotion, Short posts, This writer's life and tagged feedback, gratitude, Life, Support, writing on March 3, 2019 by Alicia Butcher Ehrhardt. I have been holding my breath for a very long time. Worse than that (but necessary), I have been saving my physical and mental energy for well over six months now, not having enough to write because there was so much to do with moving, selling the house, getting used to a new place (temp. ), and now, making the arrangements for the permanent new place. I had gotten into hoarding mode: don’t spend the resources unless you absolutely must, because you cannot get more, and there are so many things which must be done. Occasionally, I got a few days in where I was writing, or trying to, and the current scene would get a few more details or another bit of motivation or an insight, but the dark would sweep in again (okay, I’m exaggerating, but things became pressing, and I knew the whole process was depending on us doing something or making a decision on something, and it would take even longer to get over all the drama if we didn’t) and halt all progress on Book 2.
because there are so many burdens on my husband I can’t help with, and there were a few things I could do for us. I succeeded in NOT crashing, something that happens to us ME/CFS types when we overdo it, over such a long period I thought it would be forever. And in keeping up some semblance of a cooperative household. But the last couple of days I’ve realized that intense period is over. And I have slipped into a waiting mode, a hoarding mode as I said, that is no longer strictly necessary. And we do (he does) have to finalize the choice of ceiling fans. And I need to remind Facilities that carpeting has a nap, and that seams need to go where they won’t be seen (I’ll write that email today so they have it whenever Christmas is past and someone decides to install the carpet). Long story. Some progress. But I am now on my own, with a set of exercises, and a sequence leading to the hardest in the set, all laid out on paper, with the timing up to me. I have to be careful – that’s where some of that energy had to be spent – because the pattern is now ‘day of exercise, followed by two days of hugely increased pain,’ repeat ad infinitum. And dealing with that level of pain is exhausting. But we were all pleased at how quickly I progressed, even with minimum repetitions, and I can get another referral for more PT when I feel I’ve mastered this bunch. I am now officially hard-abbed and hard-assed (yay, isometrics and work against a resistance band), to a degree not acquired before. It really helped to insist on being taught correct form until I got it – the difference is quite amazing for some of the exercises. We didn’t actually do physical therapy at the PT sessions: I used them to demonstrate progress, and get trained, and find out what next, in writing and pictures. Which helped a lot when the first temp PT person, who was very good, left, and I met who she had told me was the permanent person here, only to find out that he is just as temporary! He’ll be here a while, and may still be when I decide on another bout, but I made sure he did an evaluation to document where I am now (I didn’t want to waste my last session with her on it), and there is a nice bit of progress. Nothing earth-shattering – I still can’t walk without the walker – but a huge change in strength in appropriate muscle groups, and distinct progress. And the question pops right up: are we writing? Because, given a life of luxury and doing things to entertain myself, I would rather be writing, if only I can have my brain on board, please. There will be a long (could be several months, might be just one) period between these last home choices and move-in day, but I can’t afford (writing-wise and mood-wise) to stay on hyper alert for being needed to do something at short notice, so much so that I have to save every drop of energy. And I’m having some talks with myself about how to shake myself out of wait/interruption/hoard energy mode. The old one is no longer available, whatever it was, and it didn’t allow for all the new opportunities I have now for exercising/moving/not just sitting. The social opportunities need to be sorted out – we have a large number of lovely new acquaintances, but turning a few of those into new friends is just starting. I love going to dinner and meeting new people – and wonder why I’m left as limp as the proverbial dishrag when it’s over. And the answer is that being coherent for an hour, and coping with a flow of new input, is very difficult for me. We have to eat. We can have dinner just us two at a small table. And no one will judge us. Except I do, sometimes, for having missed an opportunity! I have a tendency to retreat into sudoku and other such entertainments which can be stopped at any time (ie, the unplanned interruptions). I have a tendency to push myself to stay awake until the need for a nap is so overwhelming that it can’t really do its job of clearing out the debris of thinking. I have a tendency not to plan when I know there isn’t a prayer of being able to follow the plan. to be determined, and figured out, and planned. I have paid most of the price for a new life. I am exceedingly grateful to have it. Now I have to figure out how to open that present and live the new life, not just survive it. And to remember that the next move, however horrible, will be to the promised land (yes, I still have to turn our new balcony into a bit of a garden because all I’ll be able to see most of the time is the flagpole). Not so much New Year’s resolutions as waking up to the new world. And getting Book 2 finished, etc., etc., while still getting into the pool as often as possible, and using the adult trike, and getting up my courage to buy and use an Airwheel S8 (my long-term plan for mobility). And learning to use CBD oil to manage some of the extra pain. And doing some trips out of here for something other than picking carpeting and going to church. Present, not past or future. I HOPE each of you is getting a present, too. I’d love to hear about it. Christmas blessings to all who believe in Peace on Earth to humans of good will. There are still a majority, I am convinced. Don’t know why, except that I seem to be the eternal optimist. In spite of everything. PS Not much feedback yet, but several people here have already read PC. And it would be amazing to be invited to participate in one of the many book clubs they belong to. This entry was posted in CFS - living and writing with ME/CFS/CFIDS, This writer's life and tagged gratitude, inspiration, Life, motivation, writing on December 23, 2018 by Alicia Butcher Ehrhardt. There’s no point moving cross-county if you’re not going to improve some things in your life. Improving the physical plant happened today in two ways. We have what should be our permanent home in Independent Living. Moving in is in the future some time, because they are changing a whole lot of ‘features’ into what is their new ‘standard’ for these units. So this unit, which has not had a lot of things done to it since it was built in 2000, will have just about everything changed. They’re going to completely re-do the place, as it hasn’t been done for many years. We will get new kitchen cabinets and appliances. New counter tops. They will install our washer and dryer. New flooring throughout. We get to choose what, and colors. Crown molding lighting – and ceiling fans (they move the air-conditioned air and heat noiselessly on the lowest setting, so the heat-exchanger doesn’t come on as often – quieter). The bathrooms will be done – completely new shower and counter and sink in the master bath, and I want an accessible shower in the other one, which will be mine! All mine! for the first time in my life. I HATE sharing bathrooms. Plus whatever we want (there may be some walls moved, doors covered, etc., depending on where Bill’s office area ends up). So quite a lot, and apparently the contractors aren’t fast, and the holidays slow things down even further. It is a bit sad in there right now – and their plan is to bring things up to the current standard every time a unit is occupied by new tenants. We may not be in before Christmas, but a girl can hope. Thing is, the sooner we make OUR choices, the sooner the whole thing gets underway. So I will be nagging. Or whatever it is called when you’re the squeaky wheel. I had my intake visit with the lovely Heather from the physical therapy department. She’s what got me thinking on the topic of being heard, because, for the first time in a long time, I’m taking charge of the improvements for the body I inhabit. I like the system here with our new U. California-Davis Medical Center (UCDMC) doctors. They have the first patient portal I have ever used which has me raving about setting it up and using it. Just think: if you send an email to your doctor, he or she will respond within 48 hours. Unprecedented in New Jersey. And the portals back there were the most awful things to set up and messages through. Here they put up your test results as soon as they’re available, and just casually mention your doctor hasn’t seen them yet. In NJ, the law said you could have them, but it was like extracting teeth from small fowl, and somehow they were never available soon, and never before the doctor had seen them: bad technology trumped obeying the law. So, back on topic, I requested a referral to PT here in this facility, and the doctor not only did it without making me go visit him, but it was handled internally AS IF I WERE THE PAYING CLIENT. They called when they received it, made an appointment immediately, and I just popped on down. Heather listened, and did what many places don’t seem to bother with: she asked my opinion, and my goals, and then very carefully assessed where I am. Then she proceeded to give me exactly what I asked for: exercises to strengthen the lower back to support walking. She listened about the ME/CFS, and how much energy I don’t have, and took that all into account. She will see me once a week, so I can do things at my own pace – something no other PT place has ever ‘allowed’ (they all wanted, and said insurance would only pay for, a 3 times a week schedule). I don’t know if there will be snags in the PT. I’m pretty sure the remodeling may have some, as we were given no lists and no budget, and some things, when I asked the same question several times, would finally yield a different answer. We’ll see for both, but this is why we came here: to have options. PT is downstairs. A couple of elevators and corridors away. The amount of energy that will save me, which can be used to do the PT, is prodigious. I can actually see doing enough of this to find out how much my walking can be improved. Surgery is not on my list, especially not now, as I haven’t found an orthopedic surgeon who actually listened, and who could promise more than maybe. Also, it takes us ME/CFS types a LONG time to heal, 6-12 months after the surgery which has led to me not walking, back in 2007. It is too long to do again unless I have firm promises, and the logical thing to do is PROPER PT, not PT for little old ladies as I had before. Also, I made sure we picked the UCDMC system as the only local one with a teaching hospital (though, alas, it is in Sacramento, not Davis – huh? – but it’s not that far), and this place does post-surgical rehab right here, and they apparently spoil you in Skilled Nursing while you recover. So, if the PT doesn’t do what I need, I’ll see what else there is – but from the point of actually doing everything I can (I’m one of the young ‘uns here) that should be done FIRST (the PT in New Jersey before the spinal fusion was a joke). Teaching hospitals usually have the best facilities, and I’m hoping, orthopedists. The PT people here are set up for old people! They work with our kinds of problems. Spinal stenosis (narrowing of the channel which has your spine in it) is quite common, as are walking problems. I’ve seen a lot of things in other people, and talked to many, here. Because this reconnecting to things we dumped in New Jersey is, quite frankly, boring. We did it deliberately, and it is taking forever to re-build a life, but everyone who has moved further than ten miles knows how it is. Doing everything we should. Trying all the activities and swimming in the outdoor pool. Still have no car – and still haven’t jumped through the last hoop (getting a CA driver’s license) because there has been no time (and the studying first is a good idea). But finally the two-bedroom is on the horizon. And we can actually finish unpacking, and hang the paintings, and have something other than off-white on the floor. Meanwhile, the Pride’s Children characters are starting to nag, and I keep trying to form some kind of a schedule and have a tiny bit of energy go to fiction. I have done no marketing in ages, and have sold maybe five copies in six months. You can really disappear that way. It’s a good thing I’m not a quitter! As I always say: I’m working on it. This entry was posted in Brain training, CFS - living and writing with ME/CFS/CFIDS, Learning to walk again, This writer's life and tagged gratitude, Life, marketing, writing on November 7, 2018 by Alicia Butcher Ehrhardt. This was us last week, after quite a bit of finagling once the movers did their job – and moved most of our stuff into the one bedroom apartment at the URC complex in Davis, Ca. A bunch more boxes were stored directly in the ‘Resident Storage’ locker (no, they don’t store the RESIDENTS there). Those were raided a bit by husband in search of the lighter frying pan (I hate electric stoves even more now than before) and a few necessary significant items (dish drainer, etc., which had been packed in the bigger boxes at the last minute, along with the framed paintings). When we’re a little tidier, I’ll show you the layout, but, aside from having to switch walls on the TV because the cable outlet was on the wrong wall, we are almost out of boxes that must be unpacked immediately. I probably mentioned that, way back on July 3, 2018, I lost control of my computer (the internal hard drive didn’t have enough space for a proper recovery, even after restarting), and I haven’t been able to write in my Pride’s Children: NETHERWORLD files since then. Which is one of the reasons I started that page, so patrons can poke behind the scenes if they wish. Well, my dears, today I recovered access to my Scrivener files, and haven’t gone any further because one major happiness per day (at a great cost in energy) is about as much as I can take and still function tomorrow. If you don’t care, skip this heading. One hour of paid time with a local Mac guru who couldn’t fix it. Over an hour on the phone with a lovely man with the nickname of ‘JT’ at Apple Customer Support who hung with me as we delved into permissions on the High Sierra operating system. Over an hour today with the Scrivener knowledge base: the first article that showed up when I searched for ‘permission’ was the exact thing I needed. Plus everything I learned when talking to these people and reading stuff online. So I’m quite pleased that I was able to put all this together (the Apple guy bowed out when it became obvious that it might be a problem with the Scrivener part) in my pretty little head, and figure out that I needed to get a copy on a writable medium, go through a bunch of steps to make the permissions affected by my unorthodox method of upgrading give me access to my own files (the Mac had come to know me as both Alicia Butcher Ehrhardt and aliciabutcherehrhardt, and I still don’t know how to disabuse it of the personality split). There is probably a better way, and a way to do this in big batches, and possibly a way to mend the great personality divide, but I’m satisfied for now. And it was my prime missing part to the move. No point in just complaining on the blog, is there? You guys pay me for solutions, not problems. Hehe, as the kids say. That, and getting stains out of husband’s favorite T-shirt with a toothbrush, laundry detergent (we haven’t bought bleach yet), and a toothbrush which will remain dedicated to the purpose of laundry, have made this a good day. Both absolutely great – but I don’t think I can have dessert at a restaurant every night, and expect to fit into my bathing suit; and having dinner with new people almost every night is a whole heck of a lot more socializing than I’ve done in a long time! We’re managing both: big salad before dinner, and scheduling dinners ahead two or three times a week (the hospitality chair dropped off an actual paper calendar – and its getting USED). I had to call an old friend – we’ve been here three weeks tomorrow, and she needed to hear from me – so we’re going to go get dinner (5:30 is so EARLY), and then maybe, if it settles down, go swimming afterward. Or crash, and try again tomorrow. The weather is California, late summer, and the humidity is really low. Everything is in the same building. I’m still trying to find an adult trike to ride; promises were made about there being one here which will have to be pursued. There are so many convenient exercise and fitness classes that I’ve already overdone it. You have to work hard to get your money’s worth – but we will do it. Not the slightest desire to return to the East Coast. Over and out for now, and I’ll try to find something more interesting for the blog next time, but this is our life now, and we’re making it work. Husband is on the Security team for the Bizarre Bazaar – starting this week. 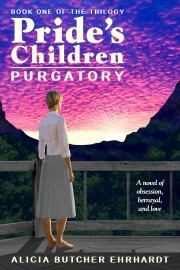 I unpacked a copy of Pride’s Children: PURGATORY, and delivered it to the library – maybe I’ll find a few readers here. And I’m getting back to work on NETHERWORLD tomorrow. Promise. Go catch up on the chapters already posted there. And how are you? What have you been doing for the last three weeks? This entry was posted in Brain training, CFS - living and writing with ME/CFS/CFIDS, This writer's life and tagged gratitude, Life, novel on September 18, 2018 by Alicia Butcher Ehrhardt. This is what I moved Heaven and Earth for: to move to a place with a pool. Not just any pool, but one in the same building, and one of four. And, of course, we moved so the kids won’t have to wait until we’re even older, and then help move Mom and Dad into the old folks home. Things have changed in the world, and we no longer needed a big house and two cars in the suburbs to bring up a family. And we were definitely not enjoying life, taking care of said house. Most of our friends are moving – and suddenly our quiet suburban court was no longer the place where we hung out. Not that I’ve been comfortable hanging out outside for years now, since I stopped being able, physically, to do even a half-hour of gardening (I truly didn’t mind pulling weeds) at a stretch. No point in lovely perennials if you never get out of the house. We’re living in our second temporary quarters of the move. The first was an Extended Stay America just north of Quakerbridge Mall on Route 1 in central NJ. We were there from the day before the movers took our stuff away (a night we slept two hours at the motel, and then stayed up all night at the old homestead while trying to get everything packed before the movers came. Not the best method for me – I’d sleep a half-hour, get up to pack for a couple hours, repeat – all night long. I’ve packed that way for ‘vacation’ trips before, and it isn’t pretty. But it had to be done. But this is much better because we’re at the guest suite until our furniture and boxes arrive at the end of the first week of September (NJ is a long way from California by moving van), and finally starting to catch up on sleep and get hooked into the system here. Shrimp and lovely no-sugar-added carrot cake for dinner tonight, with a salad someone else prepared – but I can already see we will have to be careful, or the pounds will pile on – and the clothes arriving next week won’t fit! The hours are a little on the early side for what we’ve been accustomed to, and we’re getting into the habit of being exhausted well before midnight – feels odd to a confirmed night owl, but you don’t argue with dining room hours if you want to be fed. It took me two days, but I finally had time and energy – dropped the laundry off on the way down, and headed for the pool. For a while. Then I took a shower in their well-appointed locker room (people don’t usually bother with locks) in the handicapped stall because our unit doesn’t have the seated shower. Let me tell you, I haven’t felt this safe getting clean since we took down the shower doors back in NJ months ago because the agent said the house looked tacky with them (they were old and corroding, but I could lightly hold onto the inside bar for some stability). I have achieved my goal of avoiding a fall, even thought vertically challenged. We’ll have one of these showers in the permanent 2 BR apartment when we get it, but meanwhile I will take my safe showers by the pool. Falls are a major cause of problems for people as they get older. So the first stage of the move in is over (we put things in the drawers! ), and by the next time I write, we should be in our permanent temporary (1 BR) quarters, waiting to see what becomes available for a 2 BR. And you do need to take your keys and ID badge with you every time. Not completely coherent here, but we are okay, the worst is probably over (except for the move IN coming up, and the second one some time in the future), and everyone here has been so nice. I have to figure out a better way to send the photos to the blog from the iPhone, too, but too many details to worry about right now, and my cobbled get-arounds eventually work. So bye for now. More when I have it. Moving is a pain for everyone, I’m sure, but eventually it will all be over. Can’t wait to get settled enough to write – I’m way behind. Oh, and the fitness expert/instructor seems awfully confident she can get me walking again. Please pray. This entry was posted in Learning to walk again, Short posts, This writer's life and tagged feedback, food, gratitude, Life, self-improvement on September 2, 2018 by Alicia Butcher Ehrhardt. I was so happy to be sending myself photos that I didn’t realize the phone thingy was also posting blank posts along with the images. And the names got all fouled up. And the longish post I was writing got lost. And I am just so tired, I couldn’t even face fixing things this morning. Plus an unreasonable pain from a pinched nerve just wouldn’t go away – finally tamed it with ibuprofen and hours on a cold pack. My husband isn’t sentimental about cars; we sold his yesterday without much of a backward glance, even though he’s the only owner it ever had, and I don’t have a picture. So I headed to the window, took my first picture through the screen, realized it was junk that way, took it again – and here you have the car that did the bulk of the homeschool hauling around, and all three kids learned to drive on it (and aced their parking tests! ), and it has been to Pittsburgh, PA, and to Troy, NY, bunches of time (we didn’t drive to Pasadena because that was way too far), hauled more junk than I can shake a stick at, and had its seats in and out to make space. Her name is Liz, because youngest daughter told me (I took her along and made sure she sat in every minivan on the used car dealer’s lot to make sure her older and taller siblings would fit when they visited) that if you name a car, you have to take it home. The dealer here will take her off our hands on the day we head out of town, and the convenience of having him do the transfer paperwork right has trumped any thought of selling her privately for possibly more money. Plus we’ll keep her up to the last day, and not need a rental. Plus luggage. I don’t ‘love’ inanimate objects, though I do anthropomorphize, but Elizabeth (Liz) gets thanked a lot when I leave this place – and make it back safely. and this is the last of it – and will be the first boxes opened because that’s where the toothpaste is. And the antacids. where we’re leaving whether the sale goes through or not. If it doesn’t, the house can stay under management, empty, fixed, and ready to sell until it does, and our lawyer said he can handle the closing. But signs are positive (all fingers crossed, now, guys), as it toodles along lackadaisically toward the new folk, and they have ‘happily’ (according to our agent) agreed to accept a few things we are leaving them because they really need them even though they don’t know that yet. The house is another thing I will definitely miss, but oddly, because, since the staging ladies and the painter and the flooring people did their thing it hasn’t been my house, anyway. We’ll have to remember with our memories, and the house as the backdrop of family photos, because I never got to do what I was going to do, namely clean it up for sale (but without all that newfangled staging stuff), and then take pictures. So there are birthday parties in the office, kitchen, and dining room; and Christmases in the living room; and some Thanksgiving photos’ and lots of pictures of the exterior through all the seasons. But no photos of a tidy house of mine. It may be a while before the next post, or, living in an Extended Stay America for a week, I may have so much time on my hands that it drives the words out of my head onto the page. Dunno. There are still an awful lot of things to do and I hope I don’t forget any of the ones which are critical. Or pack them inaccessibly. I left the pool floats where I will open them first, and kept a bathing suit out. First things first, of course. I think I’ll leave you to ponder the existential thrill of letting go of so many things at once and with no time to ponder individual ones, nor to take photos of most of the things which are staying in NJ in the homes of friends, strangers, and the dump. I kept the photos and the digitized home movies and the music transferred to an iPod (need to make a backup of that, too). It’s supposed to be freeing to empty it all out, to let go, finally, of project you really are never going to do (my assistant took one of them – if she does it, and sends me a picture, I’ll post it, but don’t hold your breath). I don’t feel free yet, just empty. It does and it doesn’t help that I’ve been almost completely home-bound for many years now, leaving as infrequently as possible because of the energy it takes. I will get back to writing, and learn a new, communal place, and move on to the next phase. I don’t regret any of this – but it is a very strong demarcation in my life. I’m sure you have stories from your moves – I’d love to hear. Please share. This is still our house, but really? Now? A month before we don’t own it any more? We have owned this house since it was built in 1981. March 5th we moved in, and it has had no other family in it. In all those years, we NEVER had a sewer problem connected to the street. Well, just for funsies, the day AFTER the Open House, a small sink hole developed by the curb, right near the real estate sign, and we wondered whether they had nicked the water line into the house (since no markings were made on the grass and bushes, and no flags set by utility companies). So we duly reported it, the township fixed the small sink hole, and we thought that was that. Told lawyer and real estate agent, so they wouldn’t say we didn’t inform them of potential problems (water line, sewer) that we might be required to disclose. Then we got a message on our answering machine from the head of the Sewer Dept., stating there was a problem where our sewer pipe connected to the main – in the middle of the street (so not on our property). When contacted, found out they would get it fixed by contractors as soon as they had enough for a day’s work for one. We thought it would be forever, but they started early this morning, did NOT (bless them!) ring our door bell until around 9am when they needed us not to send anything down the sewer line for a while (now over), and they proceeded to make a standard repair. Which they are in the process of asphalting right this minute. The sound I heard, which was like every helicopter in every movie, was actually a man tamping down soil and gravel into the hole with a jackhammer-like device (probably called, with all due irony, a tamper), was not Black Hawks landing on our lawn. And over much sooner than I expected – so I am impressed by our township’s efficiency at keeping us in the loop, and the contractor’s at getting a ‘not uncommon’ problem fixed efficiently and quickly. Not our responsibility, thank goodness – no digging up the front lawn and all the way to the house – no cost. I have never been happier to pay property taxes which include infrastructure. Of such is my life right now. And y’all get such interesting but ultimately unimportant trivia because I can, courtesy of iPhone and WordPress, mail a photo snapped in a moment out my office window directly to my Media Library. Gotta love the modern world. This entry was posted in Gen. Musings, Short posts, This writer's life and tagged gratitude, inspiration, Life on August 2, 2018 by Alicia Butcher Ehrhardt. ALL my ROYALTIES for Pride’s Children for April 2018, Kindle Unlimited, ebook, and print, will be DONATED to: Help me help ME/CFS investigative journalist, David Tuller, PhD Public Health, Berkeley, get funding for another year. David has been unbelievably hardworking this past year – and is up to speed. More than that, he is feared (that’s the only thing that explains it) by the UK psychologists who insist a disease I’ve had for 28+ years is both all in my head, and can be cured by 1) changing my belief system, and 2) doing more exercise. I won’t tell you how useless it is to turn a real physical illness into hysteria. And that I would be in perfect shape if exercise helped: it is KNOWN to make everything worse for us – within very strict limits, I stay as fit as possible, but going over those limits will crash me for days. Beautiful real life ME/CFS (ME/CFS – myalgic encephalomyelitis/chronic fatigue syndrome) sufferer Jennifer Brea gets our sympathy, for her wonderful documentary UNREST (hope you’ve seen it) portraying her personal story, and that of others. She’s much more photogenic than I am. The documentary was actually nominate for an Oscar! She’s also had ME/CFS much less time than I have. I really hope she recovers – something which seems to work better for patients if they rest aggressively in the early years. which has devastated the lives of so many millions worldwide, you either have to get the disease (please don’t) or live it virtually – by reading. Pride’s Children: PURGATORY lets you live with CFS for long enough to see how it gets into your bones and affects everything in your life. And yet it is only subtext to the story. One more degree of difficulty for life, living with a tiny fraction of the energy able people take for granted. I want more people aware of what someone with ME/CFS goes through, and it is similar to many diseases in some of its aspects. Chronic invisible illnesses hide everywhere among us, and we keep them hidden because no one wants to listen to the details. This would be a good time to get them to read – even to gift them Pride’s Children: PURGATORY on Amazon. As I’ve probably mentioned more than once before, I make about the same amount in royalties whether you buy and ebook or a print version, or borrow the book from Kindle Unlimited (with subcription or free trial). Paper is more expensive because there is, well, paper and shipping involved. But because it is a nice fat book, I’ve been able to price so that any of the formats available (including a KU borrow) have about the same effect on my bottom line. So you can freely choose which is your preferred format. And do a little extra with your dough. “Kary is CLEARLY a hero, by any criteria you want to apply apart from armed combat, and she is the center of the book. She lives in isolation in New Hampshire, and writes; she suffers from Chronic Fatigue Syndrome, and it robbed her of her previous career as a physician, and gave her weak/treacherous husband the excuse he needed to rob her of her family. She has other grief in her life, but she does not share the pain casually. “Andrew is an Irish actor/singer/modern day knight, who is on the verge of explosive fame, who values his privacy and guards it like a dragon guards his gold. Their paths cross in a late-night talk show, and sparks fly. Thanks to Stencil for the ability to create images like the one above – their picture and fonts, my words. This entry was posted in CFS - living and writing with ME/CFS/CFIDS, disability, Short posts, This writer's life and tagged gratitude, inspiration, Life on April 13, 2018 by Alicia Butcher Ehrhardt. The only excuse for this is that I’m pretty isolated, the kids are too far away for travel and for various reasons we two just don’t ‘do’ Thanksgiving any more (except that husband has opted to have me make his traditional pizza – I get the crust ready, he piles on everything he loves). My dear friend Sandy called this morning, to invite me out for lunch for my birthday. It’s a tradition we’ve had for a long time. As she has moved from New Jersey to Vermont (though her youngest is still here), it is an unexpected pleasure because she is here to celebrate the day at her old home. I was delighted, and we quickly agreed on a time and place. We eschewed our old ‘writing partners’ traditional restaurant because, the last couple of times we’d been there, we both agreed quality had dropped. I enthusiastically agreed to The Cheesecake Factory. They’re a bit noisy, more at dinnertime though lunch should be okay, but their food is good and has a great variety, and they have low carb cheesecake! I write the information on a Post It!, being as I am getting forgetful and don’t want to make her wait tomorrow, even changing the refill on the gel pen to make sure the note was nice and dark. I stick the note where I can’t possibly not see it several times today, which is what I need for it to penetrate. I’m sitting here at the computer wasting time, as I do in the mornings, thinking about the posts I’ve read this morning, and the general concept of being thankful for what you have, and grateful in general. I turn to erase the message on the answering machine which is blinking in my peripheral vision’s range. Suddenly, the slow-moving cogs in my brain finally do something. I stare at the note. I start laughing. She said no, and I pointed out it will be Black Friday. She still doesn’t get it. I said The Cheesecake Factory is in QUAKERBRIDGE MALL. We had a good laugh, picked a different place far from any shopping venues tomorrow, and will have a great lunch catching up. I can only imagine what it would have been like if clueless me had gotten into the car and tried to drive to the Mall tomorrow for lunch, late as I usually am at that point. I hope ONE of us would have noticed by then. Me, I’m just grateful I’ve received so many things today to make me laugh. This entry was posted in Brain training, CFS - living and writing with ME/CFS/CFIDS, Short posts, This writer's life and tagged gratitude, Humor, Life, self-awareness on November 23, 2017 by Alicia Butcher Ehrhardt. Life has been biting at my ankles this year, and I’m almost at the point of telling you you can have 2017. I don’t want it. Mother, 94, has gone to Heaven to be with Daddy, who died three years ago at 91. We imagine them dancing together again. We all thought they would be here forever, even if diminished from their prime of being one of the most vital and alive couples we ever knew. My sisters and I, growing up in Mexico City, agreed many times that they were the best parents we knew, and we wouldn’t trade them for anybody else’s parents. So many stories we can tell, and will remind each other of, but I’m sure everyone has their own family stories, and I can’t do them justice. But they SHOWED us what love is. And we hope we are passing it on. This entry was posted in Short posts, This writer's life and tagged gratitude, inspiration, Mexico, self-awareness, writing on October 22, 2017 by Alicia Butcher Ehrhardt. If you’re anything like me, when a new subject comes up, and you need to do research, you do a search (Google or otherwise), and end up for starters at…WIKIPEDIA. This entry was posted in CFS - living and writing with ME/CFS/CFIDS, Gen. Musings, This writer's life and tagged CFIDS, CFS, gratitude, ME/CFS, research on July 25, 2013 by Alicia Butcher Ehrhardt.